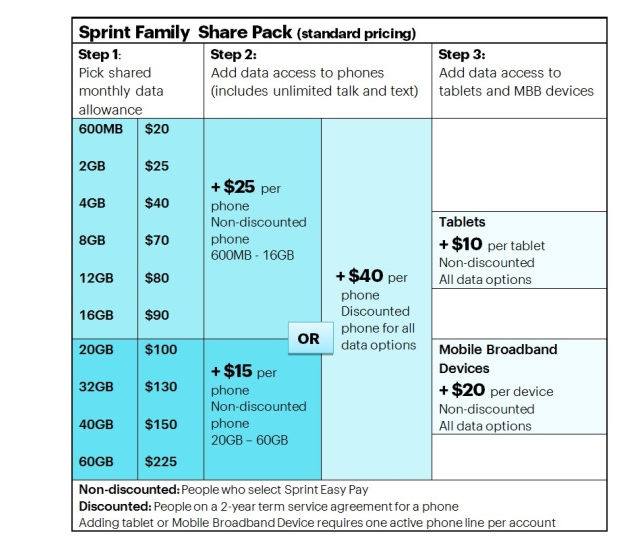 The Sprint group pricing plans that will launch on Aug. 22. As expected following the recent change in leadership at Sprint, the nation’s third-largest wireless provider is slashing prices on group plans. But since Sprint admits that its network isn’t competitive with the other big players, the new plan only offers value to heavy data users with lots of patience. The new Sprint Family Share Pack plans, announced last night, offer buckets of shared data at a per-gigabyte price lower than the competition. For example, the company is offering 20GB of shared data for $100 for a maximum 10 lines. The monthly per-device fee varies, depending on whether you get your phone through Sprint Easy Pay ($15/month) or are getting a discounted phone by signing up for a 2-year contract ($20/month). Tablets and mobile hotspot devices are also additional. So if you have four lines, you could pay $160/month for access to 20GB. That’s the same price you’d pay for 10GB of data for four devices on AT&T or Verizon. Thus, Sprint is offering double the data for the same price. Why not just cut the price on in half? Look at the above chart — there is no 10GB plan, but if you get the $70 8GB plan and pay the $25/phone device fee, a family of four will pay $170/month — that’s more than the 20GB plan with four lines. Because most people will never come close to maxing out their 20GB/month data bucket, Sprint can dangle all that extra data out there and pretend like you’re getting a great offer. So people who switch to the new Sprint plan may be saving money on a per-gigabyte basis, but they will likely leave lots of unused data on the table every month. The only consumers who would benefit from the new Sprint plans are true data hogs that use more the 4-5GB of wireless data per month and are tired of being throttled or paying overage fees to their providers. Of course, as we discuss later on, those hogs might not enjoy slurping at Sprint’s slow-moving trough. For those still interested, the plans will launch Aug. 22 and will start with the promotional pricing of $100 for up to 10 lines. And — why not? — Sprint is throwing in 2GB/month per line additional as part of that limited time offer. As part of this promo, Sprint is also willing to pay early termination fees up to $350 for people willing to switch to the new plan. But — and this is a but so big that Sir Mix-A-Lot would love it — the problem is that Sprint’s network is horrible compared to the competition. A recent test of the four national wireless networks found that Sprint’s LTE download speeds were about 1/10 that of the others. Downloading a 1.4GB movie on a Sprint network required an hour, compared to only 5.5-8 minutes for the competition. And Sprint’s new CEO, Marcelo Claure, has admitted that his company has far to go. As we’ve shown recently, wireless companies love exaggerating the speed and quality of their networks, so when a CEO comes out and says that the best his company can do right now is to compete on price, that’s a sign that Sprint’s LTE network isn’t exactly awesome.